Nathan Chapman joined the School of Law faculty in 2013 and was promoted to associate professor in 2018. Additionally, the law school student body awarded Chapman the C. Ronald Ellington Award for Excellence in Teaching in 2018. Chapman's scholarship is in two areas: the history of due process and law and religion. He has pioneered a new view of the original understanding of due process as a provision that reinforced the rule of law against every branch of the federal government, with respect to any deprivation of rights, anywhere in the world. The foundational papers are "Due Process as Separation of Powers," 121 Yale L.J. 167 (2012) (with M. McConnell); "Due Process Abroad," 112 Nw. U. L. Rev. 377 (2017); and "Due Process of War," 94 Notre Dame L. Rev. ___ (forthcoming 2018). His scholarship on law and religion focuses on the history and doctrine of religious liberty and, separately, Christianity and the law. 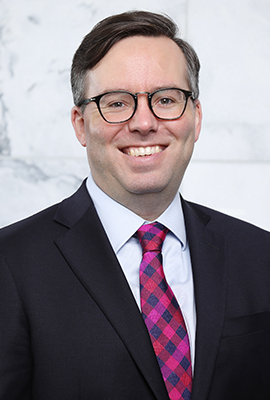 The Law and Religion Section of the Association of American Law Schools awarded him the first annual Harold Berman Award for Scholarly Excellence for "The Establishment Clause, State Action, and Town of Greece," 24 Wm. & Mary Bill Rts. J. 405 (2015). He is also the author of "Disentangling Conscience and Religion," 2013 U. Ill. L. Rev. 1457, and "Adjudicating Religious Sincerity," 92 Wash. L. Rev. 1185 (2017). He has also written several book chapters for edited volumes that are forthcoming in a series for Cambridge University Press. Chapman holds degrees in law and theology from Duke University. He litigated in the D.C. office of WilmerHale and clerked for the Honorable Gerald Bard Tjoflat of the U.S. Court of Appeals for the Eleventh Circuit. He teaches classes in constitutional law, procedure and ethics. Due Process of War, 94 Notre Dame L. Rev. 639 (2018). Due Process Abroad, 112 Nw. U. L. Rev. 377 (2017). Adjudication of Religious Sincerity, 92 Wash. L. Rev. 1185 (2017). The Establishment Clause, State Action, and Town of Greece, 24 Wm. & Mary Bill Rts. J. 405 (2015). The Jury's Constitutional Judgment, 67 Ala. L. Rev. 189 (2015). Disentangling Conscience and Religion, 2013 U. Ill. L. Rev. 1457 (2013). Due Process As Separation of Powers, 121 Yale L.J. 1672 (2012) (with M. McConnell). Law Asks for Trust, 85 St. John's L. Rev. 521 (2011). The Fourteenth Amendment Due Process Clause, National Constitution Center (with Kenji Yoshino). Substantive Due Process: Text, History, and Experience, National Constitution Center.